1. I loved that my labor began at 39 weeks and that I didn't have to wait until close to 42 like I had with Lucy. 2. I loved that unlike with Lucy's birth, my water broke first. It was interesting to experience that physically and emotionally. And it allowed me to have a calm, leisurely morning with my family as I waited for contractions to begin. We made cupcakes, walked to the grocery store, made a tee-shirt for Frida, laughed, ate, and prepared the house and ourselves for the work ahead. 3. I loved when my husband took our daughter to the park, and I had the luxury of laying in bed, feeling mild contractions, enjoying the peace and serenity of the morning, and daydreaming about our baby's arrival. 3. I loved that my sister in law, who was at the time completing her studies to become a Certified Nurse Midwife, hopped on a train from NYC at 7am and was here by noon, to support me during labor and to assist our midwife. 4. I loved knowing that I didn't have to go anywhere and that I was already where I needed to be – at home. 5. 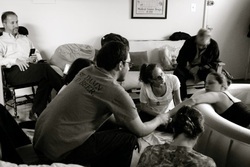 I loved how relaxed and gentle our midwife was, and how attentive she was to me. I loved how calm my husband was. 6. I loved when our midwife told my husband, "I think you should set up the tub now. ", and how she looked at me quizzically every time I said, "I think it's still early. I have a long way to go." I could tell she felt that things were moving faster than I seemed to think they were, and it was encouraging to me. 7. I loved holding my older daughter during contractions and smelling her hair – it smelled so good, like baby shampoo! I loved that she was not separated from us on this important day in the life of our family. 8. I loved hearing the quiet click of my friend/doula Deidre's camera in the background and knowing that eventually I would get to look at the beautiful pictures of this birth. 9. I loved getting to laugh, joke around, smile, and celebrate with my husband, sister in law, doula, midwives, and other family members during labor. It felt like a party as much as it felt like a birth. It felt special and ordinary all at once. 10. I loved singing loudly during labor. It felt so good and I was amazed at how well it took away my pain. 11. I loved that I never had any cervical checks, during pregnancy or labor. This really helped me feel that the labor was happening inside my body, in a private space. I never felt exposed or vulnerable. Nor did I have to worry about being disappointed if I wasn't dilated "enough". The labor was progressing and it was allowed to progress as it wanted to. This was very liberating. 12. I loved the moment when I got into the tub and felt the warm water surround me and release a lot of my pain. It brought tears to my eyes. I had been required to get out of the tub before pushing with my first birth, and getting to stay in the tub this time was wonderful. 13. I loved that my pushing this time was completely spontaneous. For me, spontaneous pushing was much more effective and intuitive than coached pushing in the hospital had been. 14. I loved that this time, having given birth before, I knew that what I was feeling was normal and healthy, even if it hurt. I knew that I was okay and that it would be over and that I'd have my baby at the end, and that the best thing I could do was to relax and work my way through the sensations the best I could. 15. I love that I got to catch Frida as she emerged into the water, and bring her to my chest right away. 16. I love that even those family members and friends who were skeptical of us having a home birth told us afterwards how lovely, safe, healthy, and amazing they felt Frida's birth had been. It was a beautiful birth.